Here are some excellent comparisons, by tonymyre311, of all the ship models (and other objects) from EVE Online, dropped onto Google Earth landscapes and edited so they look like they’re part of the map. It’s a huge gallery, starting from the smallest ship trying to find its place on the street and ends with giant space stations floating over the U.S.
Let’s start with a simple capsule. It’s an escape pod, about the size of a car. A ship easy enough to hide in one of the garages nearby. That’s not true for shuttles and rookie ships though. They might be cheap small ships in EVE, but not it the real world. Seeing even one of them hovering above a small town would be an incredible sight. Frigates and destroyers are still considered small in EVE though they’re just as big as a smaller neighborhood. Even people in the village nearby would panic. We’re getting there. Cruisers and battlecruisers are mid-size ships with around a hundred people on board. Multiple Notch mansions would fit inside. Mining and industry vessels a.k.a. ORE ships are just as big as giant oil refineries. Some of them are designed to clear out smaller asteroid fields. Compressing the friendly neighborhood below wouldn’t be an issue. Time to transport the entire town to somewhere else. Giant freighters and carriers could do that. 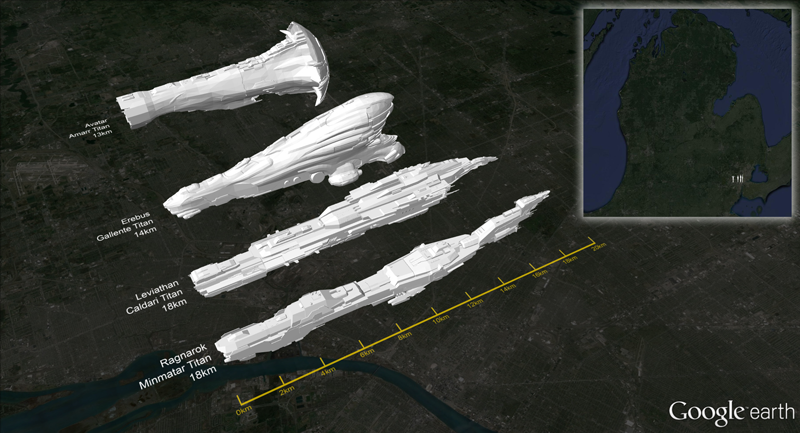 Titans, the largest and most powerful ships in EVE, are city-sized. Yet they’re not even close to the largest man-made objects in the game. We’re almost there. Stargates are much bigger. And certain stations would even make stargates look tiny. Bonus pics below. A Minmatar Dreadnought and a Providence class freighter above Chicago.